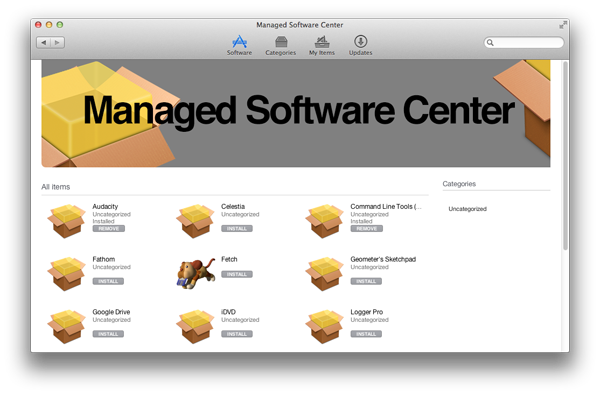 The following icon is Managed Software Center. This program manages all the updates the IT department pushes out to your computer. It can be found in your Applications folder, or by doing a search on your computer. Keeping your computer updated will help maintain your computer and keep it running properly. The icon on the right (Updates) will show you a list of items that need to be updates on your computer. If nothing is listed, your software may have already run the updates. The icon on the left (Software) will show you a list of optional downloads that are available to you, if you need them. They are not a part of the standard install on your laptop, because these apps may only need to be installed on a case by case basis.